And some research showed me that no 32bit version has been released yet. Unless I still missed something! now the JDK is showing.. I managed to get it installed and quicklaunch fired up JDev successfully. However I notice there is no "app" launcher for OSX any more (it was there in the preview). 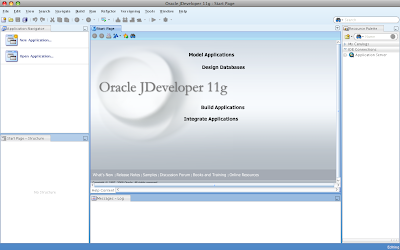 What is the best way to launch JDeveloper 11g on the Mac? Also, you can write a script for this command. I found something working but now I have problems with Eclipse and Netbeans... they don't want to start. So I will leave JDeveloper11g and try to fix the rest before my second attempt. Probably because you updated to Java 1.6 and Eclipse with NetBeans are using Java 1.5. Just my guess. A good way to launch JDev is through the quickstart.jar file in the jdevhome/utils/quickstart directory. According to Apple, you shouldn't mess with the sym links to change versions of your JDK. Those can change at any time. Instead, you can just create a JAVA_HOME environment variable. For one writeup (mine) on changing JDKs, see this blog. Sorry if that seems like an ad, I got all the info from Apple's site and you could get the same info by searching for 'environment.plist'. For Oracle's workaround on getting JDeveloper to run on the Mac, see this page. 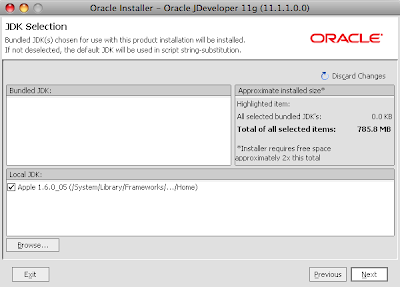 The only change I needed was a symlink to classes.jar so that the installer could find it as rt.jar. In other words, it's a change in the directory structure between Mac's JDK and Sun's.